Affordable Accoutrements: New Orleans, Baby! I've just returned home from a wonderful visit to New Orleans. 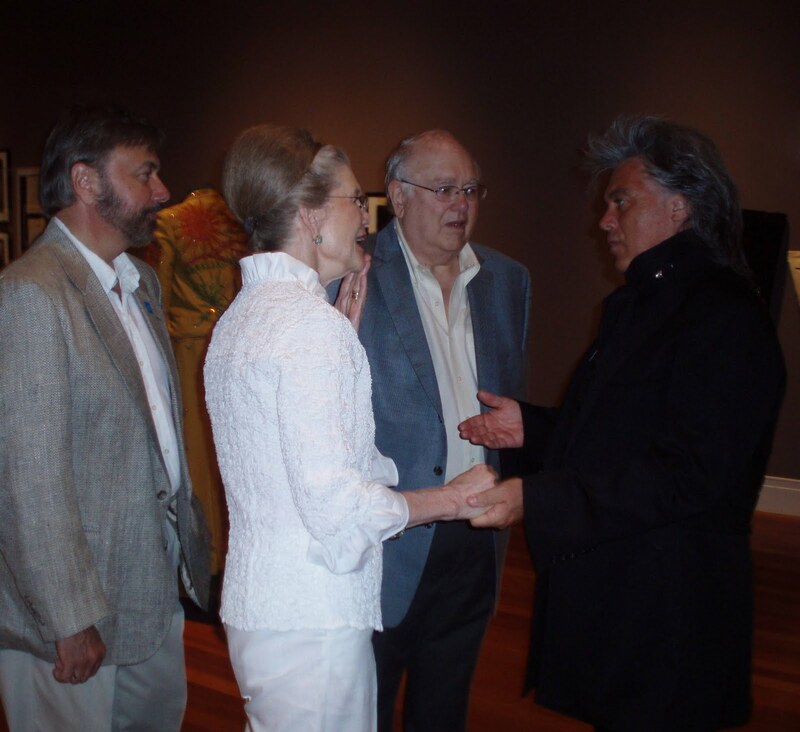 I was there for the opening of The Art of Tennessee and The Art of Country Music: The Marty Stuart Collection at The Ogden Museum of Southern Art. You can read all about the exhibitions HERE. It's a great museum, located right next door to the Civil War Museum and near the World War II Museum. They're all in the warehouse district. I stayed at Hotel Le Cirque, directly behind The Ogden on Lee Circle. It's a nice affordable place to stay near the museums and art galleries. I thought the vintage lawn chairs added a delightful touch of whimsy. The Art of Tennessee exhibition is comprised of paintings, sculptures, antiques, and silver collected by Gertrude and Ben Caldwell (below). They're two of the most delightful people on earth, and their taste is impeccable. It was great fun spending time with them in New Orleans. The picture above was taken on Friday night, just before the Marty Stuart concert. If you haven't heard him perform live, you owe it to yourself to do so. He's supremely talented and a master showman. I met people after the concert who had traveled to Louisiana from places like Nebraska, Ontario, and Switzerland to see their favorite entertainer. 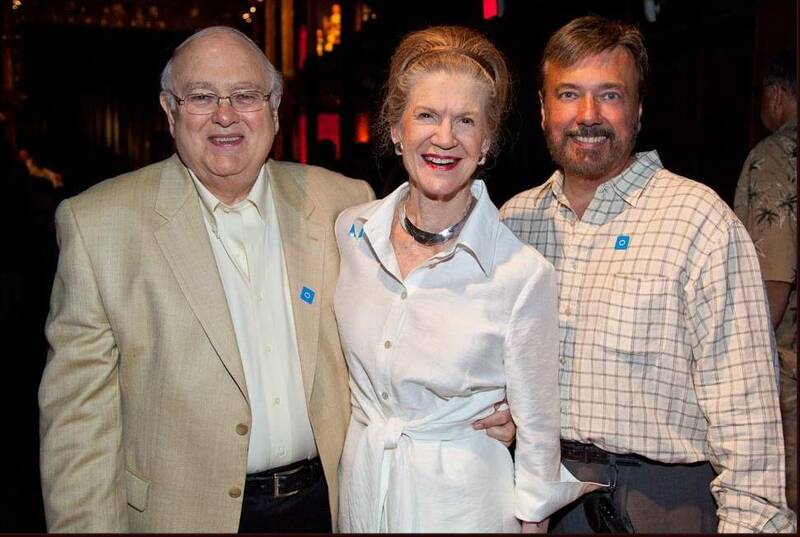 In the picture below, taken at the opening of the two exhibitions, the Caldwells and Mr. Stuart talk about their passion for collecting and their mutual interest in preserving and promoting the culture of Tennessee. We had dinner friday night at Cochon, a wonderfully unpretentious restaurant where Chef Donald Link prepares updated versions of traditional Cajun/Southern favorites. On Saturday night, Julia Reed, chairman of the board of The Ogden, invited us to Calcasieu, Cochon's private event facility upstairs. Read about Cochon HERE and Calcasieu HERE. I had the duck, but heard the fish was delicious as well. I'm not usually a huge oyster fan, but the appetizer was amazing! The bread pudding was the best I've ever tasted. 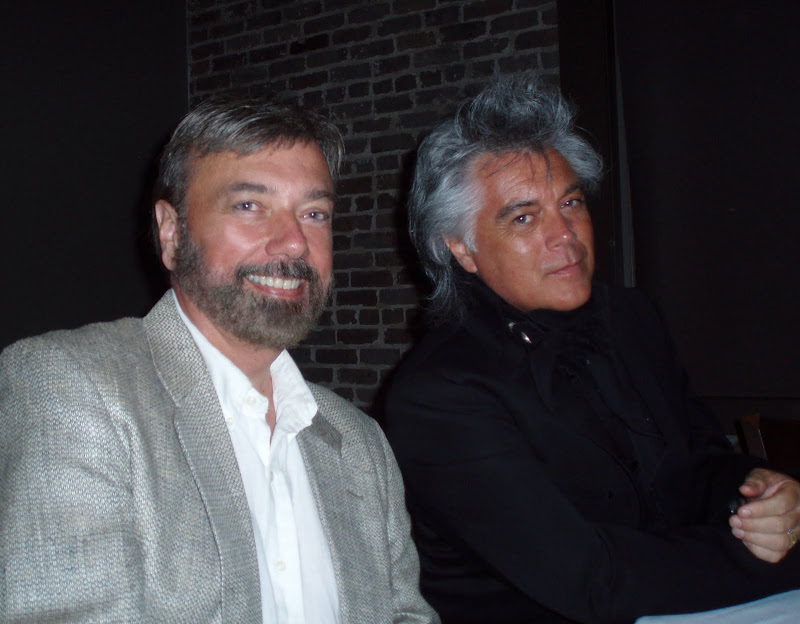 Marty Stuart seems as nice as he is talented. 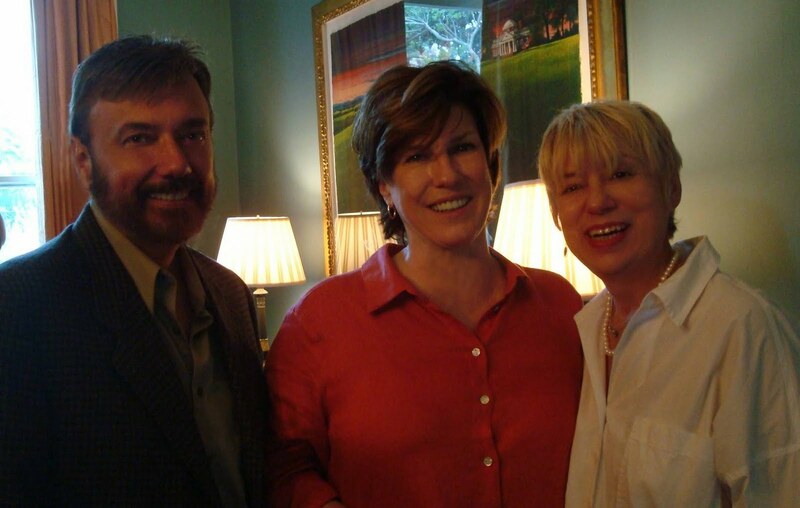 For Sunday brunch, it was on the the home of Julia Reed and her husband, John Pearce. 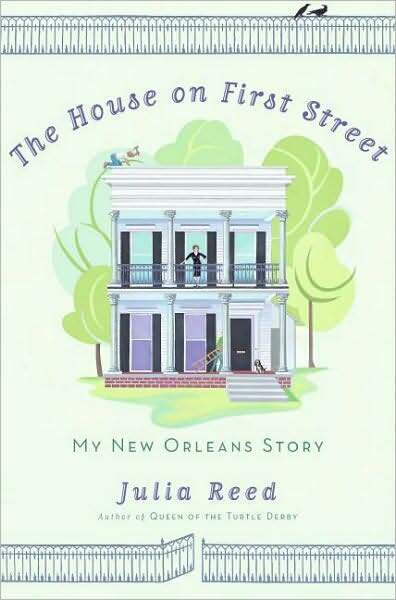 Their house was made famous by Julia's most recent book, a post-Katrina memoir (and love story with a house, a husband, and their beagle). Read about it HERE. My "plus one" for brunch was New Orleans blogger, Valorie, the Visual Vamp. Julia Reed's in the center. It was great fun meeting Julia and Valorie. They're both creative, talented, and extremely witty. Julia and John's home is beyond gorgeous! I took several pictures, but decided not to post any that showed guests' faces. Sorry -- wish you could have been there! Did you notice the serving piece is Herend Bird? I snapped this picture especially for Susan of BNOTP -- it's her favorite china. There were stacks of Herend dinner plates for the buffet-style meal and beautiful table linens (the nice, big monogrammed dinner napkins, not the little luncheon size!). 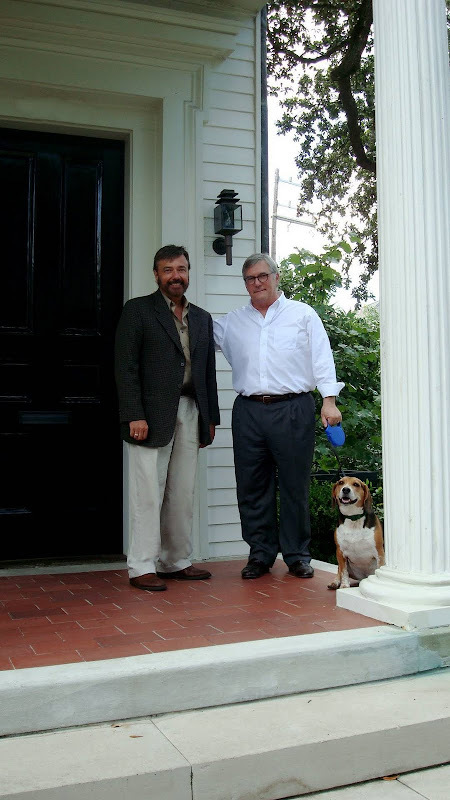 John Pearce was a wonderful host, and Henry the beagle couldn't have been more helpful, cleaning up every little crumb that dropped (sometimes urging guests to drop them faster!). John gave Valorie and me a tour of the home. We particularly enjoyed seeing their beautiful paintings, vintage/antique prints, and other unique collections. Thank you, Julia and John! Below, we're looking across the street at the former home of novelist Anne Rice. If I remember correctly, actor Nicholas Cage bought it from her. It's near a beautiful home recently purchased by Sandra Bullock. Seems the Garden District of NOLA is the place to be! I snapped a pic of Valorie snapping a pic of the house diagonally across the street. Guess what ... they invited us in! 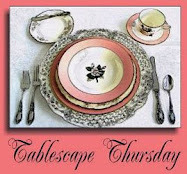 I'm joining Susan of Between Naps on the Porch for Tablescape Thursday. I hope that's OK, since I didn't set a table. Somehow I thought you'd want to hear about my trip to New Orleans. Have you been there? Planning to go? Wonderful to meet you Bill (and be your plus one! ), and this is a wonderful post about New Orleans. How fun, Bill! It looks and sounds like you had a fantastic time. Such a beautiful area. Thanks for the tour. I love New Orleans and lived there for several years near the Garden district....gorgeous homes. Looks like you had a very special visit. I was wondering where you were!!! What a fabulous trip & how nice to get a private tour of that GORGEOUS home!! I am off to find some youtube performances of Marty Stuart. He's ALMOST as good looking as YOU...but not quite!! Bill, This post was fun to read. 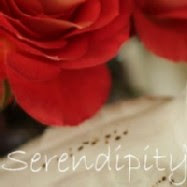 I really enjoy your photos and your description. It looks like you met some great people and had a nice trip. Thank you for sharing it with us. My goodness Bill, how much fun was that!! 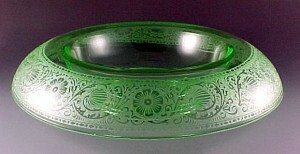 I thought of Susan too when I saw that Herend pattern. Looks like you had a wonderful time!! I fear I may only get to see NOLA through you! Thank you for the lovely tour! I've never been to New Orleans, but it is high on my Bucket List! After your tour, I'm even more anxious to visit. You look fabulous by the way! Thanks for sharing these special moments with us! .. .They're almost as beautiful as your tables. I lived on St.Charles as a newly wed...eons ago, and my husband's family is from there. It's a lovely city with even more lovely and gentile folks. It seems you really have a lot of work to do on the pics, because we're all waiting to see the entire 'photo album'! Oh...I'm green with envy. We have been to New Orleans in years and it is such a special place. We actually went there for our honeymoon many years ago. The menu, the people, the houses, the music...you really had it all going on, didn't you? Great pictures! Hi Dear Bill! Oh, I love New Orleans and have been there many many times but have not traveled in these circles! Oh, my! Looks like you had the most marvelous time and meeting so many wonderful ones! And our Valerie! She's so cute! In that one photo, you remind me of the late John Ritter! I have never been there but it has always been a place that fascinated me. I really enjoyed the mini-tour that you have given us here. Thank you. Thanks so much for the tour! I loved visiting NO several years ago and really want to go back. the food sound scrumptious and nothing goes better with that than good converstions and friends. I'm looking forward to seeing more! Well, I have been wondering where you have been!!! Wow, you lucky boy.. it looks like you have had a fabulous time. I wish I was there too. I can't wait to see inside. By the way, Bill...You look fantastic in all the photos. Your favourite fan and Aussie friend..
You not only got to be in New Orleans but you were at a Marty Stewart concert...some people live under the right star! New Orleans is my favorite city...I would love to live there if not for the heat and humidity. You look great and had a fantastic time. What could be better than that, huh? That house is certainly gorgeous and the guest of honors are quite generous in their presence as well. Great post! Thanks so much for the wonderful tour! Sounds and looks like you had a wonderful time! I am looking forward to seeing more about your trip. It looks and sounds as if you had a great time, the houses in that area are amazing. I have not yet been to New Orleans but it's on my list. Thanks for the virtual visit. I am afraid I have never heard of any of the people you mentioned but I guess they must be well known in the States. Wonderful houses and good food too while you were there!! Looking forward to seeing more photographs. Jackie in UK. What a great time you had! Such wonderful houses! Such a great story as you told it! Thanks for sharing! What a wonderful trip. Looks like you were the most VIP there! Beautiful city. I haven't been there in many years but loved it. I will check out the books. I've only been to New Orleans once and loved it! It is just so gorgeous! Looks like you had a wonderful time. Thanks for the tour. Bill, so enjoyed New Orleans from your perspective. The glamorous folks, dishes and Marty Stuart made up for no table setting. I love coming to visit! Thanks for sharing your New Orleans tour. I've never been lucky enough to go. I would love to. The food looks yummy and the buildings look absolutely grand. Wonderful tour! Bill, So nice of you to take us along with you on this artistic journey. The home is exquisite, as are all of the descritions. What a gorgeous area! So southern! You know that in my heart and fiber I am really southern, don't you. I have a secret crush on anyone with a southern accent! You look fabulously dapper! A perfect and cultured gentleman! As always, I love my visits! Thank you for sharing. It is a beautiful city. Your photo are beautiful. I can't wait to see more...I will be emailing a friend who just moved to LA and let her see your post! Thank you! Thanks for sharing and giving our city some good blog press...not everyone is so kind, always looking for the bad instead of the fabulous! BTW - Brad and Angelina's house is in the French Quarter. Love the Garden District homes, how lucky of you to be invited inside of one. Oh, I wish I could have come along with you. New Orleans is my adopted home town as my husband was born their and is a Tulane graduate. 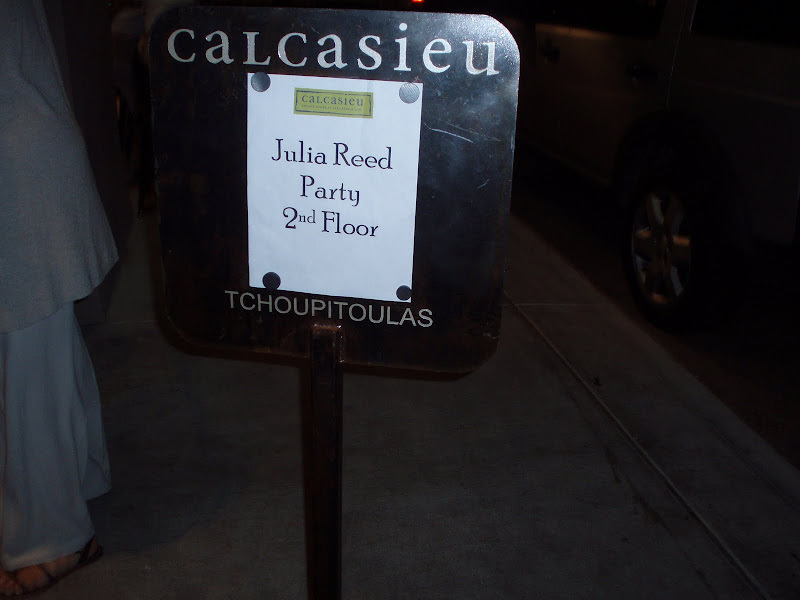 I have both of Julia Reeds books and yes, I have even been to a Marty Stuart concert (at Billy Bob's Texas - years ago). Sounds like I would have had a great time too! Thanks for posting the pics. Love seeing them! Bill, Sounds like a wonderful time! My previous job assigned me to six months in New Orleans where I stayed in the French Quarter. I fell in love with the architecture and the food. I miss the fantastic cajun dishes. Looks delightful -- would love a house tour. I've never been to New Orleans -- it's certainly on my list! Yes please show those pictures! I love New Orleans. I was able to visit briefly the weekend of Katrina and was forced to return back home. I want to go back and see and experience!! Thank you for this awesome post!! Share dear Bill, share those pictures too. You could have shown them how to set a table for sure but it looks like you had a good time. Those beautiful homes are such a treat. Country music....meh...I'm not a fan. Give me some good rock from the 60's or a little blues. Thank you for sharing an unprecedented look into several Garden District homes. I'm drooling from 5 states away! What a fabulous trip and event Bill! You made me feel as though I was your plus 2 standing next to you and visual vamp. Love her too. Looking forward to the rest of photos of this trip. Yes, yes yes! I want to see pics of your home tours. That house across the street is gorgeous! I noticed the dessert was Chocolate Chip Bread Pudding. My first chocolate bread pudding ever was in New Orleans. Two waiters came out with it hot from the oven, took two forks and split it open and then each poured warm sauce in the middle of the pudding, one poured hot fudge and one hot caramel. To die for. Can't wait to see your photos. What an exciting visit to NOLA! Wish I had been with you to tour those homes. On my last visit, I walked the streets of the Garden District, taking photos of the Christmas decorations. Absolutely beautiful! Tradition to Treasure! A Panacea? Playing Six Degrees with The Vamp!